Make Money At Home Moms, why not Work from Home? I created this webpage to help you learn how to make money from home. The truly amazing thing to me is that I created this website myself. Just a few years ago, I could barely turn on a computer, much less build a website. I wanted to be home for my husband, who is recovering from kidney cancer. I wanted to take care of my husband myself without hiring a caregiver, do the housework, yardwork and be available for all his medical treatments and never have to worry about who was taking care of him while I went to work. Fortunately, I was able to do that. But, relying solely on my husband’s income meant giving up some of the “extras”. Budgeting was tight. As food and gasoline prices continued to rise, money became even tighter. I learned that there are lots of people that makes money at home in a number of different ways. They identified their talent or knowledge and put it to work for them. I read a lot of success stories (and found out the negative Solo Build It scam reviews were a lie) and I wanted to join those successful people, but I had no internet experience. There were dozens of different hosting services. There were hundreds of sites that promised to “teach” me how to build a website and drive business to it. The cost of some of that educational material was outrageous. It didn’t take me long to figure out that an e-business was the way to go. But, getting started was a big hurdle. I made a lot of mistakes and some false starts, but finally I found Solo Build It. •	Gardening•	Herbs•	Cooking •	Budgeting•	Infant care•	Education•	Health Care•	Scheduling•	Knitting, sewing, needlework, woodwork, etc. Any talent that you have can be put to work. The more that you enjoy it, the more successful you could be. Think about the websites that you have visited in the past and those that you visit repeatedly. There are millions of other people out there that are visiting the same websites. They need or want the same information that you do. The information that you have may be valuable to millions of people. Once you have decided what to sell or what to write about, once you have that basic foundation, the rest is easy…sort of. At one time, building a website was something that only a few people could do. They were called “webmasters”. They knew the necessary HTML codes. They had some graphic design skills. But, even people that knew how to build a website were baffled by search engine rankings. They had no clue about how to attract visitors to their sites. That was something in the realm of “search engine optimization”. The webmasters could partner up with SEO providers or they could be satisfied with tens of visitors per day, when they could have gotten hundreds or thousands. Finding a website hosting/building service is actually the easiest step. But, deciding which one to choose is more difficult. Believe me. I tried several services before I found Solo Build It. 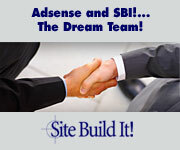 Solo Build It is unique, because they provide hosting and they make webmasters out of everyday people like you and me. HTML is a foreign language to me, but with the help of Solo Build It, I created this website and others like it on my own. I have no graphic design skills, but I can easily include pictures and videos, if I want. I can create links that lead to other websites, without writing a single line of code. At the Solo Build It (SBI) forum, I can communicate with other people that have knowledge about building the business and attracting visitors to our websites. We share our experiences and knowledge to help people get through those first tough days. How much money can you make on the internet? Honestly, I don't know. The potential is there and that is no exaggeration. You could possible earn a nice salary. I spend the morning and early afternoon working on my internet businesses. I am available anytime for my husband. On Saturdays, we go swimming at the swim center. On Sunday morning, we go to church. After church, we go out to lunch. If the weather is nice, we go to the park. If it’s raining, we go to a movie or a museum. On Monday morning, I check the computer to see how much I earned over the weekend. We are saving for a new car. I have found a way to help our family financially. You can, too. I could not have done any of these things without Solo Build It. It is an affordable, easy to use system that I recommend to anyone that is interested in making money online. I am an affiliate of Solo Build It! and the other products on this site, if you purchase one of these products I would receive a commission. I truly love Solo Build It and I would recommend it because I learned how to build a website from them. You may want to try this product too.